Back to Skool (released in 1985) was a worthy successor to the original Skool Daze. 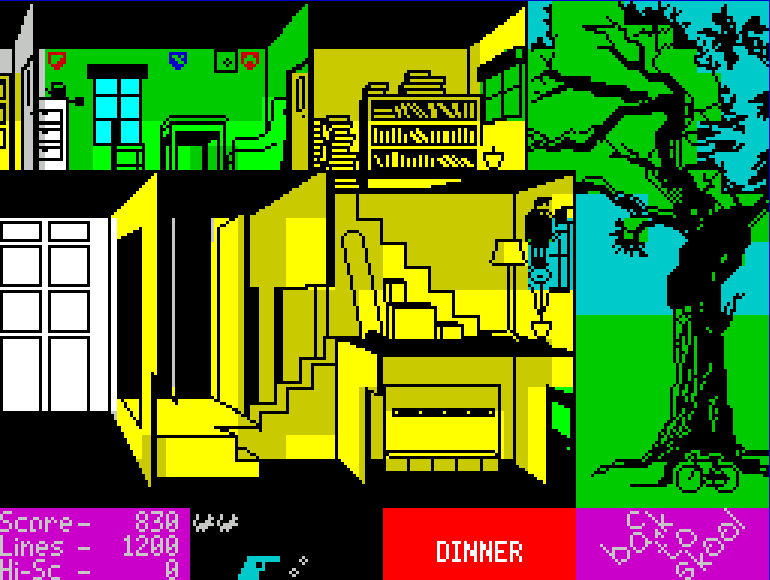 The game was expanded to include a larger play area, included additional items and it posed a far more complex 'plot' for the player to go through, in order to achieve the final goal. I never completed this on the Spectrum as I always found getting the frog into the cup so difficult under the pressure! Back to Skool features the same four main pupils that were in the original 'Skool Daze'. To the left is the loading screen picture for Back to Skool. I never thought it was as good as the original game's. Interestingly, the introduction screen now says, 'The Characters' (instead of 'Cast of Characters') and all of the teachers have now become 'masters'. 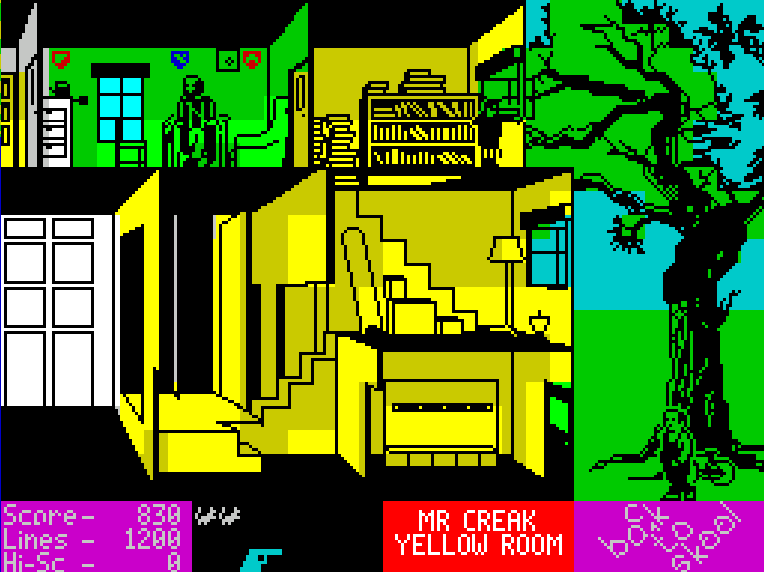 Previously, only Mr Creak was a 'master'...probably to accentuate his age and differentiate him from the other teachers in Skool Daze. Since Mr Creak is no longer such a pivotal character, maybe that's why they made them all the same. Who knows?! Mr Wacker - The headmaster who still struts around with a cane in his hand. 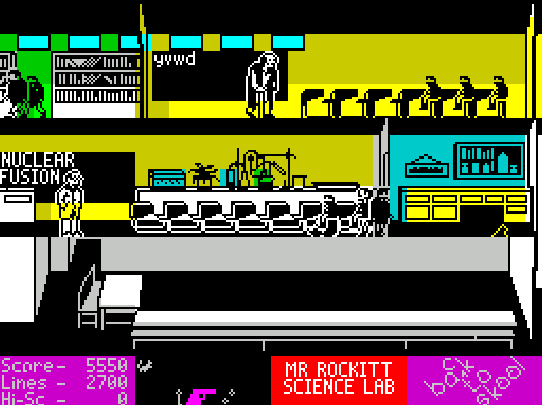 Mr Rockitt - The Science teacher who just loves to keep his hands warm in his lab coat. Mr Withit - The chilled out Geography teacher who still wears a blazer. Mr Creak - The history master. Yes, he's still alive. Just. Miss Take is the Headmistress of the girls' school. Slightly plump and with a penchent for sherry, she certainly doesn't take kindly to Eric sticking his nose into her establishment. Albert is the school caretaker. Seemingly friendly, he prevents Eric from escaping from school during lesson time. A quiet, but ruthlessly efficient gentleman! Boy Wander - The blonde lad who loves his catapult. Angelface - The school bully who loves nothing more than punching other people. Einstein - The snotty nosed brainiac who stitches Eric up all the time. Eric - The hero of the game and the character you control! In addition to the four usual suspects, there is one additional main pupil character. Eric's rather feisty girlfriend, 'Hayley'. Click on an image to see it full-sized. Back to Skool features a far more convoluted 'plot' than it's predecessor. The plot must be followed through in sequence, in order to complete the game. 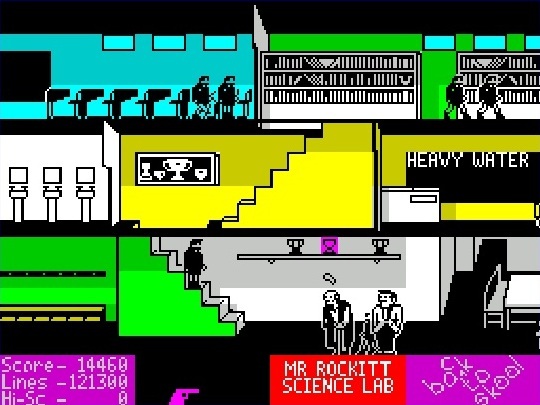 Eric's ultimate aim is to put his doctored school report back into the safe in Mr Wacker's office, (this following on from his antics in 'Skool Daze'). Once these three tasks have been done, the remaining activities can be tackled, and the game can be completed. Note that tasks 1 & 2 can be completed in any order, but task 3 can only be completed after task 2 has been done. It's also worth noting that the 'official' approach to game completion (as per the game instructions) would require you to also open the window on the 2nd floor. This is because the game expects you to only be able to slip past Albert the caretaker by knocking him out with a conker from the tree. However, in my experience this is not really necessary, since Eric can quite easily get past Albert without knocking him out. (See 'escaping' below). 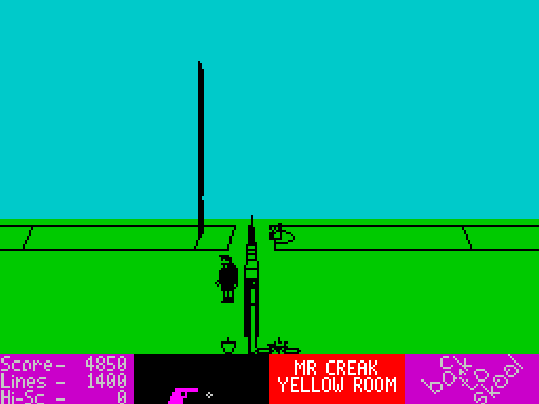 So your very first task in the game is to locate the water pistol and stink bombs. These items are separately hidden inside two school desks; the locations of which are randomised and changes with each new game. The desks containing the items can be located in either the boys' or the girls' school (or a combination of both), so it's just a case of searching systematically until you find the items. To search a desk, you must sit down and hit the 'O' key. (See image left). The bike is very useful for several reasons, Firstly, (and most importantly), you cannot complete the game without it. Only by using the bike are you able to put the frog into the cup in the girl's school. Secondly, using the bike is by far the quickest method of getting around. It is much quicker than running. If you need to make a mad dash between schools, jumping on the bike and pedalling like crazy is the best method. You never get told off for cycling the bike outside, but if you are spotted doing so in the boys's school, you will be given lines however. Remember that Miss Take will always give you lines anytime she spots you in the girls' school! Thirdly, the bike can always be used to jump over the closed gate that separates the two schools. This can be very important (and is otherwise impossible to do if your water pistol is filled with sherry). Once you have the water pistol, it will appear as an icon in your inventory. 'Squirt' the water pistol at the middle cup on the display shelf in the boys' school. This will fill the cup with water. The image above shows this. 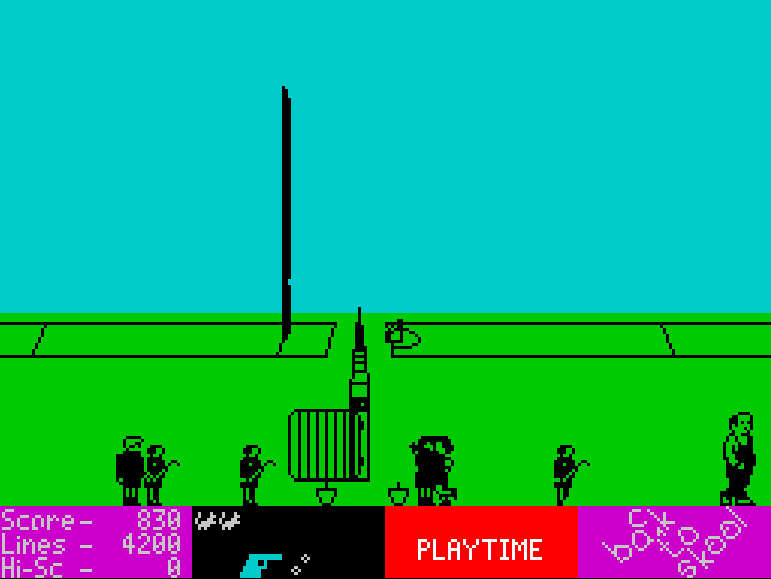 You then have to use your catapult to shoot the cup, releasing water onto each teacher's head. When the water lands on their head, they will reveal a number. Each teacher will reveal number when soaked. When you have all four numbers, write the four digit code onto a blackboard and you will get a confirmation sound and you should see the bike unlocked, laying on its side by the tree. (See image left). Note that is possible for two or more teachers to have the same letter code. Also, you can write the four-digit code onto a blackboard in any order. Therefore you do not need to remember the actual sequence of the numbers. In order to be able to escape from the boys' school during lesson time, you will need to jump out of the 1st floor window above the stage area. To get past Albert, the caretaker, the official requirement is for you to knock him out with a conker from the tree. To do that, you need to open the 2nd floor window and fire your catapult into the tree, knocking a conker onto his head. Both windows are closed when the game begins. In order to get them open, you must drop a stinkbomb when Mr Wacker is nearby. It is best to start with the top floor window. Drop a stinkbomb right outside his office (when he is in his office). He will come out and immediately open the window. Then run down to the 1st floor and drop another stinkbomb near that window. When he comes down the stairs, he should open that one too. You'll almost certainly receive lines when you drop a stinkbomb on the top floor, but it is fairly easy to avoid lines when dropping a stinkbomb on the 1st floor. Once open, the windows will remain that way for the rest of the game. Once you find and open the desk containing the stinkbombs, you will be given three and they will appear in your inventory. If you mess up and need more, you will have to go back to the same desk to re-open it, in order to resupply. It's worth noting that you can get Mr Wacker to open the 1st floor window without receiving any lines. As he starts to come down the stairs, release the stink bomb at the last moment and then run away quickly. If timed well, he will not spot you but still open the window. If you jump from the top window of the school, it's game over! Eric flies like a brick and hits the ground with a crash, possibly killing himself! 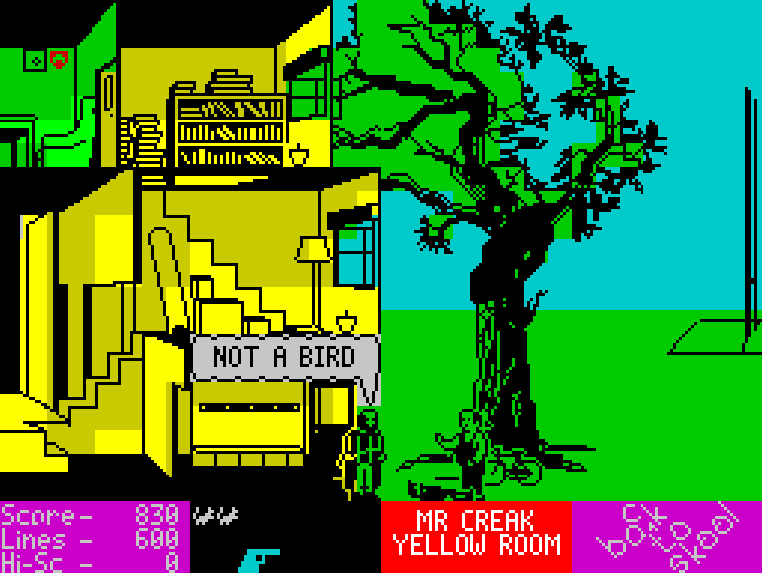 A very thoughtful Mr Wacker comes along and informs your prone corpse that you are, 'not a bird' and the game re-starts. 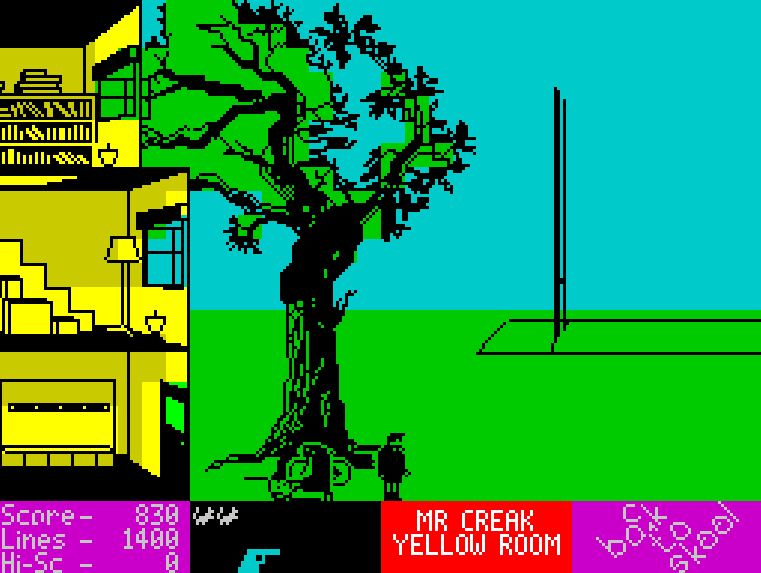 The top window is meant to be opened so that Eric can fire his catapult into the tree opposite and drop a conker onto Albert's head, knocking him out. However, (as mentioned earlier) this is not really necessary as it is fairly easy to get past Albert without doing this. In order to escape from school during lesson time, you must squirt your water pistol onto the flower that is next to the 1st floor window and then jump onto it so you can hop out the window. Albert stops Eric in his tracks! Here you can see Eric standing on the handy flower, enabling him to jump out of the window. The image above right shows what happens if you do this when Albert is near the tree and facing you. He will put his arm out, preventing you from running past him. Furthermore, he will shout out, 'MR WACKER, HE'S ESCAPING!' - alerting the cane-wielding headmaster who will come and get you. However, Albert is not the most vigilant of authorities and if you run back towards school a bit, Albert will normally turn round briefly, allowing you to run past him. Of course, Mr Wacker will still be coming for you, but you can still high-tail it to the girls' school and grab the sherry. Usually the bell will go for the next lesson before you receive too many lines. If you time it well, it is possible to drop down out of the window and run past Albert without him alerting Mr Wacker at all. Ideally he needs to be as close to you as possible and facing away from you as you touch the ground. This gives you the best chance. It's largely down to luck, since Albert's movements are not entirely predictable. Even if he is facing you when you land, if you are quick and he is quite close to you, he will not have time to put his arm out and alert Mr Wacker, giving you freedom! Remember though, that your class teacher will still come for you no matter what. However, this is never usually an issue because they cannot reach you in time to give you lines before the bell for the next lesson goes. Note that 'Dinner' and 'Assembly' do not count as lesson time. Having just explained above that you do not actually need to knock Albert out, in order to escape from school, I thought I should still mention what you are supposed to do. After all, some people might call doing the above an exploit. I have no issue with it, since it is not always successful and to be honest, does not have a mammoth bearing on the game. So if you do want to knock out Albert, then you will firstly need to get Mr Wacker to open the top window. This is done by dropping a stink bomb on the top floor when Mr Wacker is nearby. Once the window is open, you are then free to fire your catapult into the conker tree. You are best off standing tight against the wall when doing this (to reduce the chances of Mr Wacker spotting you should he be in his office). Your catapult will hit the tree, releasing a conker which drops vertically down to the floor below. Poor Albert, out for the count! Albert paces back and forth at the foot of the tree, so you will likely have to shoot several times to get lucky enough to hit him. However, it is not that tricky. When he is hit, you can then jump out of the bottom window with no fear of Mr Wacker being alerted. Albert will stay unconscious for a good amount of time, allowing you to run past. Luckily he does regain consciousness - and always seems to do so before the next lesson or playtime! Note that when you're firing your catapult on the top floor, if Mr Wacker is pacing back and forth in his office, sometimes he will come near his door and see you. When this happens you will be given lines. There is not a lot you can do about this, since he is giving you lines for just being there, not for firing your catapult. 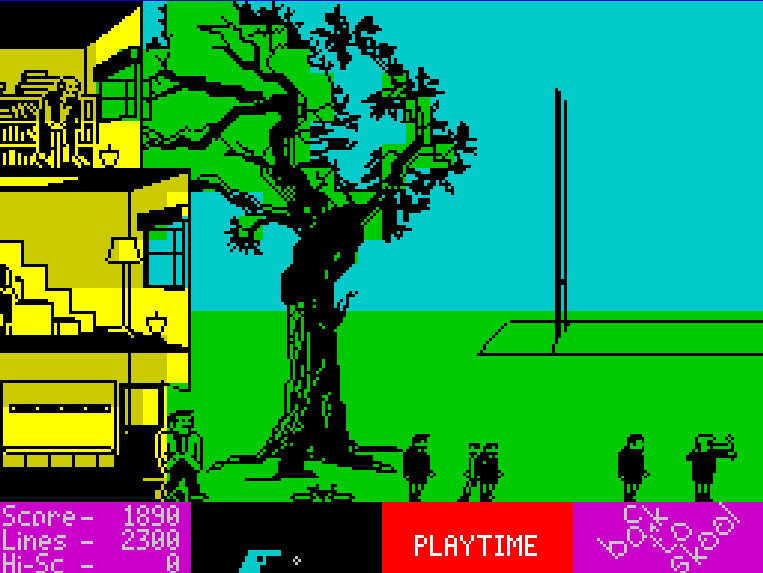 The initial water pistol (filled with water) allows Eric to escape from school during lesson time. However, it must be filled with sherry in order to progress the game. Miss Take will only open her liquor cabinet when she is certain that all the boys are back in school during lesson time. The basis for this is whether or not the door to the boys' school has been closed. (Albert will never close that door until all boys are safely back in school for their lessons). Before you plan on escaping from the boys' school during lesson time, I recommend you leave the bike in the playground on the girl's side of the gate. 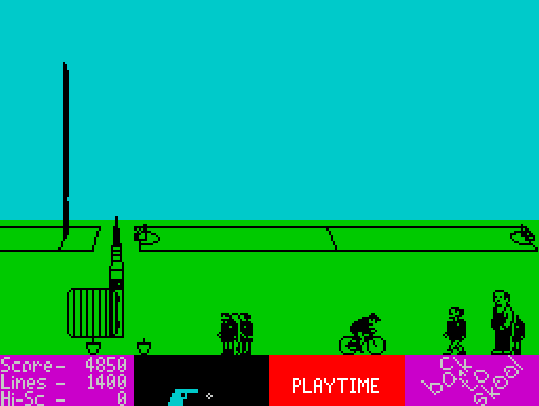 Then, when you escape from the 1st floor window, you can use your water pistol to jump on the flowers and get over the gate and then use the bike to get over the gate on the way back (see hints/tips below). It is very handy to have some spare mice in your inventory at this point. So try and plan ahead accordingly. If Miss Take is on the top floor (as in the image left), she will come for you as soon as you reach the top floor. Release all the mice you have and then jump for the sherry and run for it. If the mice are released right next to (or inside) the classroom, the girls (and Miss Take) will all jump up onto the desks to avoid them; giving you ample time to hot-foot it out of there! You can see in the image on the left, that the cabinet is open and Eric is ready to pounce. At this point, Eric cannot be spotted. Remember that as soon as you reach the top floor, Miss Take will come for you. She will chase you all the way to the school gate, raining down lines upon you as she goes. So be ready to get the hell out of there! If Miss Take happens to be teaching on the 1st floor (as in the image below), you may want to release the mice on that floor on the way up, then go for the sherry and run back down again. You can see from the screenshot that Miss Take and one girl are stood up on the desks in terror! Remember, mice or no mice, if you end up being stuck on the girls' school side of the gate, Miss Take will eventually catch up with you there and just keep giving you lines until you hit 10,000 of them, or the bell goes; so it's very important that you previously have that bike ready on the girls' school side of the gate! If all goes well, when you jump up at the cabinet, you will get a confirmation sound, a border flash and you will notice that the water pistol icon in your inventory will now be magenta in colour. You are now ready for the next stage of the game - to unlock the science lab storeroom! Filling the pistol with sherry whilst Miss Take jumps on the desks! 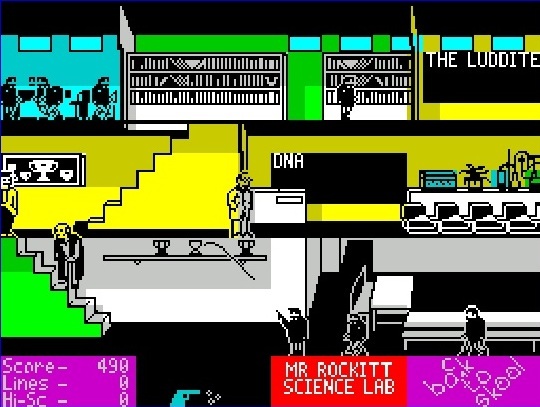 In order to get the frog (which is required to complete the game), you must first unlock the storeroom that is located at the back of the science lab. This room is initially locked. To open it, you must find out the four digit combination code by getting each teacher drunk. Once you have filled the water pistol with sherry (see previous section), you will need to fill the middle cup in the boys' school with the sherry and use your catapult to knock the inebriating liquid down upon each teacher's head. You can see in the image on the left, that the cup is now a magenta colour, indicating that it is filled to the brim with liquor! Just as you did to find out the bike code, you need to time your catapult release so that the liquid in the cup lands on the teacher's head. They will then fall to the floor and reveal their code. Note that the 4 digit code is always comprised of letters and it is possible for a letter to be used more than once. When writing the code onto a blackboard, you may do so in upper or lower case and also in any order - so you do not need to remember the sequence of the letters. When you have all four codes, write the combination on a clean blackboard. You should receive a confirmation sound (and the border will flash). A key icon will appear in your inventory and you will then be able to walk into the storeroom whenever you wish. In the storeroom, you will now see a delightful little frog hopping around. Bend down and pick the little fella up by using the 'C' key (as if you are trying to catch mice). Alternatively, leave the door of the storeroom open for a while and watch him hop about on the first floor! If you're lucky, he may even make it into the toilets! The frog, ready for collection! To use the bike. Stand next to it and press the 'B' key. Immediately after this, tap the 'O' and 'P' keys sequentially to start pedalling. (Note that you can also use the standard left and right 'run' keys ('5' and '8'). It's important to start pedalling almost immedately after getting onto the bike, otherwise Eric will just fall off. If you stop pedalling and do nothing; for a brief time you will 'free-wheel' along and then shortly afterwards the bike will tip over and Eric will fall onto the floor. The safest way to get off the bike, is to press the 'down' key (6). When you do this, Eric just hops off and remains standing on the ground. The bike will continue to free-wheel away for some distance however. Eric pedals his way between schools! Eric has a girlfriend in 'Back to Skool' and by the looks of it, he's done quite well for himself. The shapely 'Hayley' sure is the hottest girl in school! Also, in gameplay terms, she has a practical use. Hayley will write some of Eric's lines for him! By hitting the 'K' key, Eric can kiss Hayley. When he does this, Eric's line count is reduced each time by 1,000. This is very handy indeed. The image on the right shows Eric and Hayley in a clinch. Eric's line count has been reduced down from 5,200 to 4,200. This line-reducing mechanic can be critical to your success in completing the game. However, it should be noted that Hayley will only ever kiss Eric a maximum of six times in a single game. If you try to kiss her after doing so six times, Hayley will lay you out with a punch to the face! You should also realise that it is possible to 'waste' your kisses. So if you have less than 1,000 lines, do not waste a kiss! However, 6,000 lines is no mean total to shave off your line count. Thanks Hayley! Ordinarily, there are two legitimate ways of crossing the closed school gates. 1) Using the water pistol (filled only with water) to make a flower grow and then jumping onto the flower to get across the gate. (See image on left). 2) Standing on the bike and then jumping over. (Image on right). However, a third way is possible (see quirks & bugs section below). Standing on a sturdy flower! Using the bike, Eric leaps over the locked gate! Using the first method is straightforward. The only tricky thing about squirting the flowers with water is that occassionally if you are trying to do it 'under pressure', you may initially misjudge the 'squirting distance'. Using the bike however can be far trickier. It is possible to stand on the bike and jump over the gate, whilst you are actually cycling the bike towards the gate, but it is very difficult to pull off and you will usually just crash into the gate and end up in a heap on the floor. Far easier is to just have the bike lying on the floor, right next to the gate (see image above right). Position Eric over the top of the bike, press 'B' for bike and then immediately press '7' (the 'up' key). Eric will get on the bike and then should immediately leap over the gate! You can write the codes on the blackboard in any order! If you squirt your water pistol at the flowers and it contains sherry, the flowers will not grow! This can be a real pain if you are then stuck trying to escape from the girls' school. If the lesson is 'Revision Library', you are free to run around the school. Beware that going into another classroom will cause you to get lines if spotted. If 'Revision Library' follows directly on from playtime, Eric must still go back into the school before coming out again to get the sherry. (Miss Take will tell you to 'Get back to School'. Once you have filled your water pistol with sherry, there is no way to change it back again, so that it only contains water. The original desk where the water pistol was stashed, no longer offers you a pistol. If you attempt to escape and Albert manages to stop you (calling out, 'Mr Wacker, he's Escaping!') - if the lesson changes in between Albert doing this and Mr Wacker coming for you, Albert (and Mr Wacker) resume their normal duties. Freeing you up to continue your escape to the girls' school! (This is of course assuming that another lesson/dinner/assembly followed on from the previous lesson). 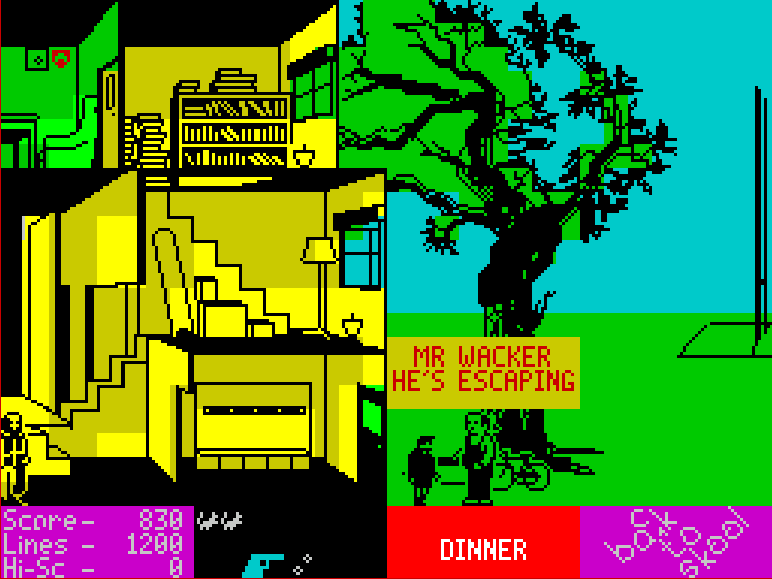 If Albert alerts Mr Wacker when you escape from school, but the bell goes for the next lesson, Mr Wacker will forget all about coming for you. This is extremely useful and can be used to your advantage by escaping from school, towards the end of the current lesson. It is necessary to be more accurate with your catapult firing in Back to Skool. The 'knockdown zone' of a projectile is quite a bit smaller than in Skool Daze. Cycling the bicycle through the grounds between schools is perfectly allowed during playtime. You will not be given lines. If Miss Take spots you in her school during lesson time, she will chase you out of the school all the way to the middle school gate, giving you lines all the way. When you grab the sherry, try and wait for Miss Take to be rubbing out a blackboard. This gives you more time to escape, as she will not come after you until she has finished clearing the board. When attempting to jump over the gate using the bike, timing is very, very difficult. It is far easier to simply crash into the gate and then get on bike, stand and jump; all in quick succession. 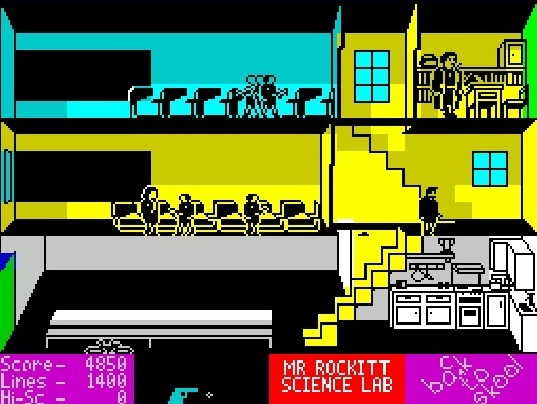 Interestingly, unlike in 'Skool Daze', teachers are now able to 'spot you', even if your 'head' is on a different floor to them. In the previous game, teachers could not spot you (for example if you shot them with your catapult) if you just moved down some stairs slightly so that your head was not on the same floor as them. This is no longer the case so be mindful of that. When soaking the teachers (with either water or sherry), release your catapult as the teacher is under the 'shelf bracket'. You can do this either side - so if the teacher is walking from the left or the right, it doesn't matter. Release your catapult as they go under the hinge and you will hit them on the head every time. It is possible to kiss Hayley through the school gates whilst they are still closed. Doing this also drags Eric through to the other side! (See image on right). It is entirely possible to become locked in Mr Wacker's office. (See image below). If you follow him into it and stay there when he leaves, you will not be able to get out. Furthermore, it is possible for any teacher to come into the office and find you (should you be missing their lesson for example). If this happens, you will be given lines. Unfortunately, no teacher apart from Mr Wacker seems to know how to get out of the office during lesson time! - So you will be stuck in there with the teacher until Mr Wacker comes back or until the bell goes for the next lesson! During Assembly, if you sit down facing the wrong way, you will receive lines and be told, 'NOW SIT DOWN'. (See image below). It seems that this is a bug with the wrong text being used. Either that, or it is intentional and an example of saving game memory; as this message is also used in classrooms. I guess a brand new piece of speech would otherwise be required (perhaps 'SIT PROPERLY!' or something). Now sit down! - But I am! You can only release mice in the girls' school. If you try elsewhere, Eric will not even attempt to do so! You cannot release individual mice. When you hit the 'R' key, all mice you are holding are released. It is not possible to shoot Miss Take with your catapult if she is jumping about avoiding mice. If you time it perfectly, you can run past Albert without actually knocking him out. Just as he closes the school door, it's possible to nip past him. Albert the caretaker is immune to catapult fire! Albert will never give Eric lines. You do not receive points for knocking over teachers or Albert. Also, Albert never ventures under the cups. The other boys do not get told off for being in the girls' school. Only Boy Wonder and Angelface go into the girl's school (presumably Einstein is far too good to risk going in there). It is not possible to 'soak' any of the main pupils using the cups. The water/sherry just passes through them. It is possible (though very difficult) to knock out either Boy Wander, Einstein or Angelface with a conker from the top window. The conker hitting sound effect is provided (as if you have knocked out Albert) - but the pupils will get up again shortly after being hit. If you manage to do it to Angelface, you are rewarded with the princely sum of 100 points! It is no longer possible to jump on top of flattened pupils (more's the pity!) Presumably this ability was removed because it is no longer a requirement for completing the game (like it was in Skool Daze). However, I would have preferred it if they had left it in! It is possible for Hayley to receive lines if she is blamed for a teacher being knocked over. However, no points are rewarded for this. Miss Take will always 'see' you in the girls' school, if you are on the 1st or 2nd floor - regardless of whether you are actually within her line of sight. If you shoot Miss Take on the 1st floor in the girls' school during lesson time, she sometimes blames Boy Wander for it! Miss Take will go as if to 'close' her sherry cabinet when it's already closed, if she was previously unable to open it because Eric was not in school. Miss Take will go to 'open' her sherry cabinet when a lesson starts - even if it is already open. Miss Take will always close her liquor cabinet during Assembly. The frog can escape from storeroom and hop all around the school on that floor, but it cannot go up or down stairs. At 'dinner', make sure you stand at least 4 steps in from the left-hand end of the bench and no more than 2 steps away from the right-hand end of the bench or you will be given lines by the teacher on duty. You can tell when a teacher is coming for you because their pace quickens. However, if you get back into position before they reach you, they will return to normal patrolling again. If you jump from the top window, it's game over. Catapults will still ricochet off a teacher's head as if they have been knocked to the floor. This throw back from the original game has no gameplay element to it though. During 'Assembly', the girls also have one in their school. They all congregate on the ground floor. It is not possible to 'guess' any of the combination codes for the bike or for the science lab storeroom. (For example, you cannot get three of the codes and then just try guessing the fourth one by adding to the code sequence that you put onto a blackboard). This means that you must soak each and every teacher and get them to physically release their code. You cannot safely 'hide' in the science room lab cupboard! A teacher will always go through the 'door opening' animation - regardless of whether the door is actually closed or not. If you drop a stinkbomb that would normally make Mr Wacker open the top window, and the lesson changes before he reaches the window, he seems to forget all about it and goes back into his office. It is still possible to attend classes where there are too many boys for the number of seats available. However, unlike 'Skool Daze', Eric no longer gets dislodged from a seat. If you get happen to hit the 10,000 line threshold but then manage to jump up to the safe to complete the game, Eric 'goes up a year' and the game restarts. However, despite the lines being greater than 10,000, Eric is not expelled. You can then play the game with impunity. Back to Skool is a terrific game and I think the makers made a valiant effort to expand and improve upon the original 'Skool Daze'. However, something about it - perhaps because it's slightly less focused, just diminishes its appeal a little bit. I think one of the key things I do miss from the original game, are the 'events' that took place sporadically. I think they really added to the gameplay and injected a sense of tension and panic. I wish there were some in Back To Skool. I guess the makers decided that Eric had enough on his plate and they were not needed.